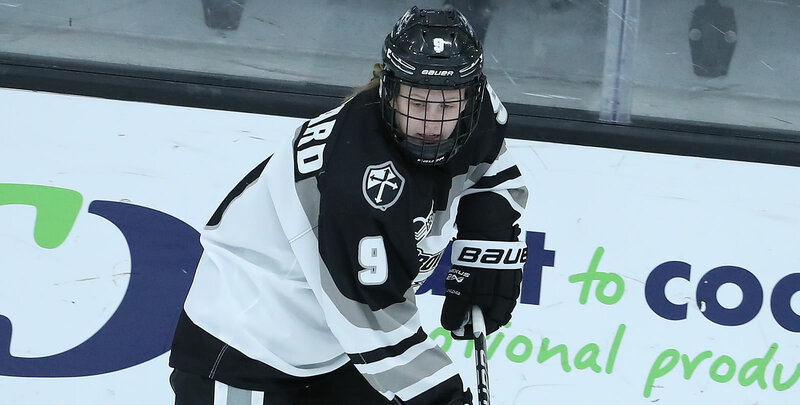 ORONO, Maine - The Providence College women's hockey team battled to a 2-2 tie with the University of Maine Black Bears on Saturday, Feb. 9 at Alfond Arena. - The Friars went on the penalty kill just 4:27 into the contest. Providence was able to kill it off, and actually ended up with the best chance of the two minutes as Avery Fransoo (North Battleford, Saskatchewan) streaked in on a breakaway. - Near the midpoint of the period, Annelise Rice (Excelsior, Minn.) rang a shot off the post. Maine ended up hitting a post late in the period as well. - Celine Tedenby, who scored for Maine yesterday, made it 1-0 for the Black Bears 1:06 into the second. She picked up a turnover, skated into the bottom of the left circle and fired a shot over Madison Myers' (Colchester, Vt.) near-side shoulder. - Providence wasted little time creating a response. Sara Hjalmarsson (Bankeryd, Sweden) played it from the corner to Neve Van Pelt (Mitchell, Ontario). She was able to knock it in at the back post to make it 1-1 just 1:53 later. - Van Pelt's goal was her third of the season. Hjalmarsson picked up her 11th assist on the play. - Maine had back-to-back power plays in the middle of the second period. The Black Bears were able to convert on the second as Cailey Hutchinson made it 2-1. - The Friars completed a four-goal middle stanza by scoring with 1:33 left on the clock. Meaghan Rickard (Coventry, R.I.) scored her second goal of the weekend and sixth of the season to tie the game at 2-2. - Maureen Murphy (Buffalo, N.Y.) and Avery Fransoo assisted the goal. Murphy's assist was her 19th of the season and Fransoo's was her 13th. They both had assists in Friday's game as well. - The third period featured back-and-forth action. Maine held a slight advantage in shots on goal, 10-8. Myers made 10 saves in the final period to help force overtime. - Providence dominated during overtime, leading 5-2 in shots on goal. The Friars had 1:35 of power play time to close the game but were unable to find a game winner. - Myers finished the day with 24 saves, while Carly Jackson made 25 for Maine. - The Friars are now 1-1-2 in overtime games this season. 1-0 (Maine) - 1:06/2nd - EV - Celine Tedenby (unassisted) - Shot from the bottom of the left circle over Myers' near-side shoulder. Providence hosts No. 3 Northeastern on Saturday, Feb. 16 at 2:00 p.m. It is the final home game of the regular season and will be the program's Senior Day.